These headlines — which aren’t cherry-picked; they’re representative of what’s out there — display a palpable sense of panic. What’s happening? The short answer is “time.” Nothing – long-distance runner, living organism or economic trend – continues in one direction forever because the longer the journey the more imbalances accumulate. In a runner these manifest as muscle cramps and shortness of breath. In an economy you get soaring debt, rising inflation, labor shortages and overpriced assets. These make it harder to keep going, and increasing difficulty spooks traders and politicians, which in turn spooks the headline writers. What happens next? People who were obliviously riding the growth wave try to make sense of this new pattern and discover that things aren’t as good as they thought. Maybe they find this chart (from Real Investment Advice) illustrating how pretty much all the “growth” the US has generated in the past few decades has been due to rising debt. Then they wonder what this means for their mutual funds, and find this chart from the same source showing that, contrary to recent experience, stocks don’t always go up. Our hypothetical person’s blithe optimism evaporates and they begin to act accordingly, dumping their stocks and telling friends to sell their houses, annoying most but converting a few who spread the word further, and so on, until the economy’s general mood turns dark. “Buy the dip” becomes “sell the rip,” cash becomes king, growth stocks are judged on their P/E ratios rather than subscriber trends. And everything is revalued with risk rather than reward in mind. Is this that kind of phase change, or just a blip in a continuing expansion/bull market? We won’t know until after the fact, alas. Especially because there’s still at least one big potential player out there with the power to keep the game going: Corporations have been buying back their shares since 2009 and are projected to buy another trillion or so dollars worth in the coming year. If they follow through, it’s possible that all that new cash will push the “illusion of prosperity” even further past its due date. But it’s also possible that regardless of how much cash they have on hand, corporate executives, as pattern-seeking humans, will notice market psychology shifting and decide that instead of being a good time to buy, this is a great opportunity to capture some dumb money by selling shares at record high prices. Note on the above chart what buybacks did in the two years after their 2007 peak. They went negative, meaning more sales than purchases, which turbocharged an already brutal bear market. They could do that again. It just depends on their mood. Gaza and Israel may be bracing for their most serious fight in years as security continues to deteriorate. A brief lull in hostilities this morning gave way to a barrage of rocket fire and mortar rounds by Hamas into Israel throughout the afternoon. Having already deployed additional infantrymen and Iron Dome systems to the border with Gaza, Israel Defense Forces are sending more armor. The armed forces have been given the go-ahead to strike Hamas targets in Gaza, according to the Times of Israel. Notably, nothing Hamas has done so far – not even the reported strike on an Israeli military bus with an anti-tank missile – has demonstrated new capabilities. Every munition the group has used has been used before and so falls within the “normal” bounds of retaliatory attacks. Even so, the situation has worsened markedly in that past 12 hours, and if it continues to do so, Hamas may resort to using more serious weapons such as precision-guided missiles and long-range munitions. That will only lead to still more aggressive Israeli reprisals, potentially including a land invasion. More striking than the type of attacks is the timing. Egypt has been working hard to broker a long-term Israel-Hamas truce, and it seemed as though progress was being made. Last Thursday, Israel allowed $15 million of Qatari money into Gaza – denominated in U.S. dollars and conveyed in three large suitcases, according to local reports – so that Hamas could pay civil servants. Israel has been eager to pacify Gaza so it can deal with bigger threats to the north – namely, Hezbollah in Lebanon and Iran proxies in Syria. It’s possible that the sudden rash of violence was engineered by those eager to scuttle the plans. 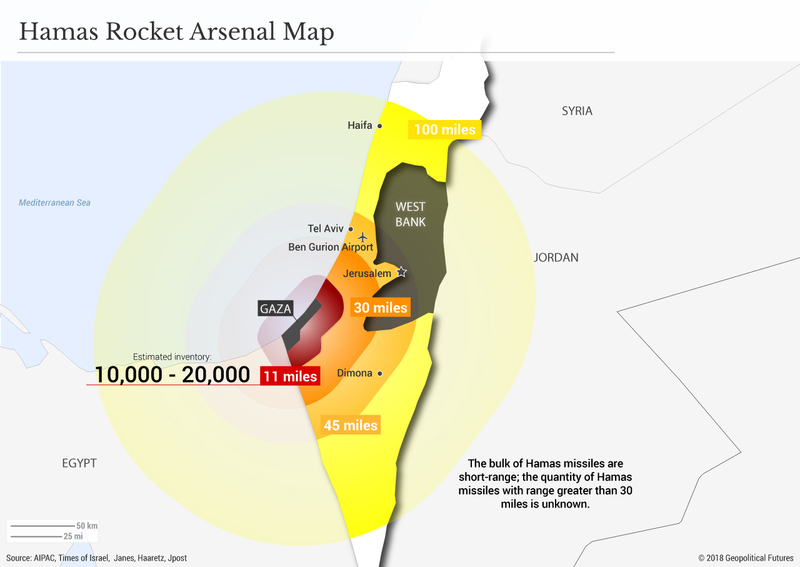 It’s just as likely that Israel wanted to strike a quick blow before turning to its enemies to the north. Whatever the case may be, it’s clear that Egypt’s peace talks have failed. Israel appears to be preparing for an increased tempo of operations in Gaza, and potentially for a limited ground incursion. Hamas seems ready for a fight. The only questions that remain are how quickly the violence will escalate and whether Egypt can pull both sides back from the brink. Judging by current Israeli deployments and continued Hamas rocket fire, Cairo will have a hard time restoring calm soon. This most recent round of Hamas-Israel violence may be just beginning. - Thought the month of October was bad? It may be only the very beginning of the beginning. - The long-term rhythm of the U.S. economy has been badly disrupted for many years. - An economic and stock market heart attack has been building for nearly three decades now with several close calls along the way. - The cleansing process is not pleasant, but it is necessary in fostering long-term growth. - Even if U.S. stocks fall into a prolonged bear market, capital markets are always filled with attractive return opportunities. Investors may just have to work at it going forward. The U.S. economy has historically moved with rhythm. Every three years on average, the economy would expand. And then for just over a year on average, the economy would fall into recession. This historical rhythm is important in maintaining balance in the U.S. economy. For by periodically entering into recession, the economy is given the opportunity to cleanse the excesses built up during the last expansion and build a stronger base for the next phase of growth. And while policy maker hubris has led us to try and cheat this historical cycle by trying to take the good while avoiding the bad, history tells us that the practice of trying to cheat recessions can bring far greater consequences down the road. The rhythm of the U.S. economy has been disrupted in recent years. According to the National Bureau of Economic Research (NBER), the historical relationship described above remained consistently intact barring rare exception for 128 years from 1854 to 1982. But then something dramatically changed about three decades ago right around the time that Alan Greenspan took the reins as Federal Reserve Chair. The idea was fully embraced that the U.S. economy could effectively cheat death and enjoy continued growth without recessions through the active implementation of fiscal and monetary policy. But as the old Chiffon Margarine ads taught us way back when, it’s not nice to fool Mother Nature. The first instance of cheating economic death came in 1986. Under normal economic rhythms, the timing was right for the economy to slow that year. And so it was in 1986 that economy growth began to fade. But instead of falling into recession, the fiscal and monetary policy makers managed to ease the economy into a “soft landing”. U.S. stocks celebrated and ramped higher into 1987. And we all know what happened by October of that year. Unfortunately, the ability of policy makers to “save the day” only emboldened them to up the ante going forward. The next rhythmic disruption came in 1994. After lowering interest rates aggressively to reduce the depth of the 1990 recession, the Fed acted to ease inflationary pressures by tightening policy. But they were able to tighten slowly enough to avoid a recession. Unfortunately, what followed was the start of an epic market bubble where the S&P 500 posted back-to-back-to-back-to-back returns of +38% in 1995, +24% in 1996, +39% in 1997 and +42% in 1998. The economy cheated death once again in 1998. A year following the outbreak of the Asian financial crisis, the recession threat was lapping up against U.S. shores following the Russian ruble crisis and the collapse of Long Term Capital Management. (Remember how a single hedge fundrequired a $3.6 billionbailout orchestrated by the Federal Reserve in order to save the global financial system? Quaint, right?). But once again policy makers intervened by lowering interest rates. And instead of the economy falling into recession, it stabilized. And what followed in the coming months was the full blown inflation of the technology bubble in into its final and most infamous stages. A stock market heart attack finally ensues. By the turn of the millennium, the U.S. economy had skipped three of the past four recessions. And the excesses that built up and never cleansed out of the economy along the way started to boil over. The markets finally buckled, with stocks falling into their worst decline in a quarter century. And the economy soon followed into recession in 2001 with spillover effects lingering well into 2002. Get on your feet and buy a house! But even after two decades with only one shallow recession leading up to this point, the magnitude of the economic contraction in 2001 was still relatively modest. This once again was thanks to exceptionally aggressive fiscal and monetary policy including interest rates that were locked near 1% for roughly three years from 2001 to 2004. Of course, what followed was a massive housing bubble with catastrophic consequences for the global economy. 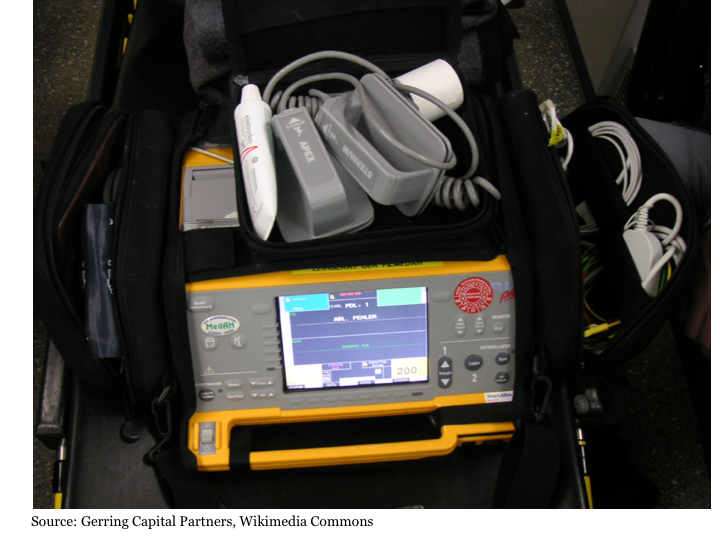 Not so sudden near cardiac arrest. The Fed, after tightening policy for two years from the summer of 2004 to the summer of 2006, declared it was ceasing to raise rates further citing a pending slowdown in growth that would help diffuse mounting inflation pressures. The intent of policy was to try to achieve yet another economic soft landing. But by this point, the consequence of trying to prevent recessions and the economic excesses being cleansed from the system was on the brink of exploding. And so it did in now historic fashion starting in 2007 and culminating in the financial crisis of late 2008. Paddles! Clear! Now on you go. Despite the economic pain so many have endured over the last few years, the outcome could have been vastly worse had it not been for unprecedentedly aggressive fiscal and monetary policy response. Indeed, the recession was severe, but it could have been worse. Unfortunately, by taking such decisive policy action yet again and not being able to resist keeping the economy on a heavy policy adrenaline rush in the years since, we set ourselves up for potentially an even bigger cardiac episode going forward. Missed treatment in 2012. According to the rhythm of the economy, after three years of economic expansion, we reached the point where it is time for another recession. And the stage was clearly set for such an outcome as we moved toward the summer of 2012. U.S. economic data was increasingly fading, Asian economies were slowing and Europe was descending into its own crisis. 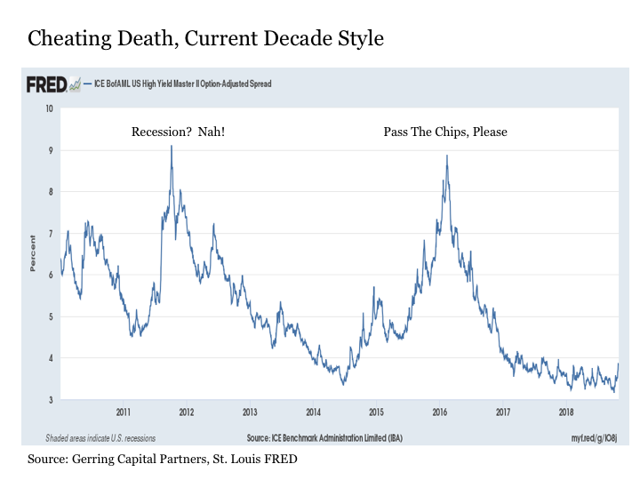 One of many indicators suggesting accumulating underlying economic stress was the sharp rise in high yield bond spreads into late 2011. But policy makers once again simply could not help themselves, as they operation twisted and quantitative eased for the third time no less with a declaration of unlimited medicine in order to keep this economy afloat. Recession avoided (for the time being), further excesses accumulated. Another missed treatment in 2016. Next up after skipping 2012 was 2016. And like clockwork, we were heading in that direction starting as early as the summer of 2014. Over the next 18 months into early 2016, oil prices fell by more than -75% and corporate earnings were falling by double digits. And see if you can find the signs of accumulating economic stress in the high yield bond market over this same time period in the chart from 2012 above. But did policy makers allow the economy to fall into recession? Sakes alive no! Instead, the Federal Reserve along with their global monetary policy compadres busted out the economic crash cart once again, postponing interest rate increases, and injecting another $6 trillion in monetary adrenaline into the global economy. Get up and keep running, U.S. economy, you’re OK! So here we find ourselves in late 2018. After the global financial system almost died nearly a decade ago thanks in large part to policy makers thinking they could cheat economic death for nearly two decades prior, they wasted no time in getting right back to their old bad habits, having disrupted the rhythm of the last two economic recessions since. Awesome! I’m certain this will all end really well. Thanks Alan. Thanks Ben. Thanks Janet. The stakes are rising for financial markets. With each successive effort by policy makers to try to smooth over recessions if not bypass them altogether, they have prevented the economy from cleansing itself. As a result, they are creating consequences that are becoming increasingly complex and more severe for the next time around once a recession finally arrives. The economy will eventually cleanse itself whether policy makers like it or not. It would have been best to let the U.S. economy get on with it in 2012 and 2016 and let the economy recede, as it would have gone a long way in preventing unintended consequences and a more severe outcome down the road. But just as the heart attack victim should have cleaned up their diet and exercise habits many years before, we now find ourselves in that notorious spot of “coulda, shoulda, woulda”. Except that for many economic and market participants, the cries keep going out for “more, more, more”. When will we ever learn? Stock market shortness of breath and chest discomfort. What we have been seeing first in January 2018 and now in October 2018 is not the end. Instead, it is the beginning of the beginning of what could turn out to be a very long road for stocks over the next decade. Historically high stock valuations with generally tepid underlying economic growth outside of a fleeting tax cut sugar high coupled with a growth dampening historically high debt-to-GDP ratio along with corporations also leveraged to the gills having spent the last many years gorging on the repurchases of their own stock. What is not to love about the stock market outlook heading into the 2020s? Don’t be complacent. Stay calm, invest passively, and hold your stocks through whatever lies ahead? Stocks always rise in value over the long-term, right? Maybe. But ask stock investors from just about any other part of the world outside of the U.S. how that has worked out for them since. Let’s put it this way – most are still waiting more than one, two, three decades to get their money back, and this is despite the extraordinary measures by global central banks. What happens the next time around when this support has gone away? Stock investing is not as easy as it has seemed in recent years. It is also important to remember the following almost always overlooked reality that underlies the U.S. stock market. Remove 21 years from stock market history – the 16-year period from 1950 to 1965 when the U.S. was the unrivaled economic superpower of the free world as the rest of the planet rebuilt itself from World War II, and the 5-year period from 1995 to 1999 during the manic rise of the tech bubble, and the U.S. stock market has provided investors with a real annualized rate of return of less than 2%. You still have time. Now is the time to check the vital signs of your portfolio. The current correction will run its course and the stock market will eventually bounce. How high from here remains to be seen. Nonetheless, stick with passive investing only if you think that the Federal Reserve is both committed AND able to keep making the stock market rise after doing so for so many years with so little to show for it other than two (three?) epic financially destabilizing asset bubbles. Instead, consider where attractive long-term investment opportunities actually exist today and slowly shift your allocations accordingly. Just because the U.S. stock market as measured by the S&P 500 Index may fall into a bear market does not mean that opportunities are not abundant in capital markets. It may not be a great experience for the sleepy passive investor, but bear markets are often regarded as the best times for active management. It’s not a matter of if at this point. Instead, it’s a matter of where. It’s not about standing on the sidelines and waiting for the next bear market to arrive. Nor is it about putting your S&P 500 Index fund into a drawer and forgetting about it (how do those Nikkei 225 Index circa 1989 or Shanghai Composite Index circa 2006 products look today?). Instead, its about positioning today for what may lie ahead in the immediate-term, short-term, intermediate-term, and long-term. And it’s also about having the patience to see today’s attractively valued opportunities through to fruition over time. The next bear may be bad. But you can be better if you are ready. Markets are jittery. Volatility is increasing. Everyone seems to be expecting the market sell-off to sharpen. They disagree on the reasons: rising interest rates, increasing trade tensions, burgeoning government debt, additional Brexit uncertainty. Some people also add the growth of funds that track market indices like the FTSE 100 and the S&P 500. I do not know what will cause the next market correction, but I can give you five reasons why index investing will not be the source. The surging popularity of index tracker funds makes them an easy target, particularly as the potential cause of an event that has not yet happened. But that is not a valid reason to point the finger at them. If anything, these current criticisms reveal confusion about the nature of both markets and indexing. First off, volatility and bear markets pre-date index investing. Crashes and corrections were part of investing life long before the invention of index funds. The first such fund began in the mid-1970s, many decades after arguably the most famous stock market crash of all time in 1929. The underlying causes of major market downturns usually lie in a combination of macro­economic imbalances and speculative investing. The second reason is that there is no discernible correlation between the growth of indexing and market downturns. Relatively recent bear markets — the 2000-2002 bursting of the technology bubble and the 2008-2009 financial crisis — attest to this. The percentage of fund assets in index-linked funds grew steadily, while the market rose and fell in a seemingly random pattern. This should not be a surprise. Index fund assets are a small part of the overall market, which is the third reason. As such, they are unlikely to be a source of instability. They make up only about 10 per cent of the value of global equity and bond market capitalisation and even less of trading volumes. For US equities, easily the largest asset class among indexed strategies, sales and purchases related to the portfolio management of these strategies represent less than 5 per cent of the daily trading volume of the US stock exchanges. Some market commentators argue that in a sell-off, index investors will all run to the exits at the same time, selling their funds and dragging down markets even lower. But my fourth reason for defending index investing is that there is no evidence to support this contention. In 2000-02 and 2008-09, investors sought out, rather than sold, index funds, which experienced significant cash inflows. You could make the case that these ready-made portfolios were viewed as attractive safe harbours during tumultuous times precisely because they are often low cost and well diversified. But I think that growth was part of a structural trend. More and more long-term, buy-and-hold investors are switching to index investing. The fifth reason relates to exchange traded funds — the investment fund structure many people use to follow indexing strategies. ETFs have experienced rapid growth over the past 20 years and are criticised for being a speculative trading tool and a source of price swings. And yet, ETFs’ share of the overall market is small, around 13 per cent of global investment assets in 2017, according to Morningstar data.In addition, because of the way ETF trading is structured, most sales and purchases have no direct impact on the price of the underlying investments. They are therefore unlikely to drive market volatility. US research by Vanguard indicated that for every $1 in ETF trading volume on exchanges, less than 10 cents resulted in primary market transactions in the underlying securities. Put another way, more than 90 per cent of ETF trading did not lead to the buying or selling of the ETF’s underlying investments. Scaremongering about market crashes ignores the successes from the growth of indexing and ETFs. Index funds are an easy way for ordinary people to invest for their future. With one trade, individuals can own a portfolio that is broadly diversified and low cost — two features that improve investment returns and are core to our investment philosophy at Vanguard. Despite efforts to pin the blame for volatility on them, index funds are not going to go away. Neither, of course, is market volatility. A prominent Chinese economist has publicly challenged a core concept in China’s policy. In the past 40 years, China’s economy has certainly grown dramatically, and there are three possible explanations for its rise. The first is that it was simply the result of removing impediments to growth, such as Maoism, war and imperialism. The second explanation is that China developed economically for the same reason that other nations like the United States and Japan did: It adopted sufficient elements of a free market system. The third explanation is that China grew because of a singular model dubbed “socialism with Chinese characteristics.” This has been the main explanation backed by the Chinese government since the reforms of the 1970s. Each of these explanations elicits a different response. If China’s growth was simply the result of removing barriers to development, then there’s little the government can do now to keep up the impossibly high growth rates. It simply exceeded its own potential and will now return to a steady equilibrium through declining growth rates. That means the credibility of post-Mao China is at risk. If China’s surge was the result of liberalization, then more liberalization should bring back the country’s rapid growth. But at a time when the Chinese government is beleaguered with problems, it needs short-term solutions to contain the grumbling, and economic liberalization can be accomplished only over the long haul. The first two explanations are untenable from the Chinese government’s point of view. While one limits China’s horizons, the other might unleash forces the government can’t control, and neither addresses the politics of disappointment. The third explanation is the best approach from Beijing’s perspective. It dictates that this period of slowing growth is merely a brief lull in China’s inevitable rise. The problem is that the unique virtues this view espouses haven’t been visible for a while (perhaps because of the 2008 financial crisis and the resulting global decline in demand for exports). Asserting China’s uniqueness raises the question of why the Chinese economy has not continued to surge. The government has, therefore, de-emphasized the Chinese model. And with this has come the spread of suspicion in China that the 40-year surge was not the result of any particular Chinese virtues and that people should temper their expectations for continued economic growth. This leads to a general recalibration of personal hopes and fears, one with implications for the government. The big question is why Zhang was permitted to deliver a speech that rejected the idea of a Chinese model and implicitly supported radical economic liberalization. Last week, the head of Peking University, where Zhang gave the speech and where he is also a professor, was removed. It’s unclear whether there was a connection, but perhaps this is a sign of the beginning of a change of course in China. A perhaps more reasonable explanation is that Chinese President Xi Jinping will be meeting with U.S. President Donald Trump at the upcoming G-20 meeting in Argentina. The Chinese may read U.S. tariffs as the result of fears over their claims to having a unique model of economic development, including a secret ingredient that makes China unbeatable. From the Chinese point of view, allowing a prominent academic to trash the idea that Xi is trying to make China great again might comfort Trump and lead to some accommodation. The alternative explanation is that China respects academic freedom, and that means allowing a university professor to attack a core Chinese concept, despite the government’s own objections to his critique. Whatever the reason, a report on the speech appeared in the South China Morning Post, a respected and well-connected publication based in Hong Kong, so Beijing couldn’t have tried too hard to suppress it. Given China’s economic problems, which the tariffs have only exacerbated, the answer to the questions of why Zhang gave the speech and why he hasn’t been punished for it is extremely important. It may be just a gesture for the United States, but it is a gesture that will also be felt in China. At this point, I don’t know what it means, but I do know that it means something. In the 1990s, the concept of the “technological convergence” entered the public consciousness. Though it seemed implausible to many at that time, phones, TVs, and computers would merge into a world of connected devices. The impact of the electronic revolution on our lives has been unparalleled—but it was only a precursor to a far more profound biological convergence. Three interconnected forces are driving this transformation: the end of human poverty, falling fertility rates, and much longer healthspans. In my last several columns, I predicted the publication of peer-reviewed evidence that aging can be prevented and reversed within the next few years. Shortly after, several readers sent me stories about scientists in Singapore who nearly doubled the lifespans of the C. elegans roundworms. The study, published in Developmental Cell, describes how a cocktail of drugs, including rapamycin and metformin, nearly doubled C. elegans’ lifespans. 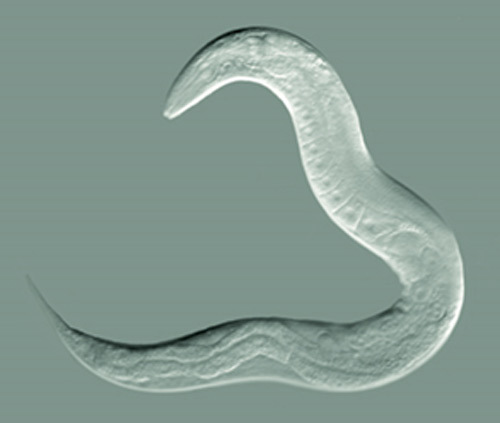 Obviously, roundworms are not people, but they share many of the pathways associated with human aging. Moreover, preliminary results indicate that the drug cocktail yields similar benefits in another well-studied species, the fruit fly Drosophila melanogaster. This study was not the evidence I was predicting. Nevertheless, it proves that concepts considered controversial just a few years ago are now mainstream. Science Alert quotes the principal investigator of the study, biochemist Jan Gruber from Yale-NUS College, who says, “If we can find a way to extend healthy lifespan and delay ageing in people, we can counteract the detrimental effects of an ageing population." Already, fertility in the developed world is well below replacement rates. There are still some areas with growing populations, mostly in undeveloped regions of Africa, but that’s changing rapidly as standards of living rise. How fast? According to two researchers associated with the Brookings Institute, last month marked the tipping point where 50% of the world’s population achieved enough discretionary income to attain “middle-class” status. Most of this change has taken place in the last few decades. Even in sub-Saharan Africa where many population groups still endure poverty, lifespans are increasing. Average caloric intake is about what the US Department of Agriculture recommends for moderately active adults. Almost nobody forecast such rapid global economic progress, which has come about due to more political and economic freedom. Most people, including journalists, are still unaware that it has even happened. Because the developing world is adapting technologies from the developed world, improvements in health and wealth appear to be accelerating. However, that means past forecasts of slowing population growth have underestimated how fast birthrates will fall. We don’t really understand this link between longer lives and lower birthrates, despite what some people claim. Some of the reduction in birthrates is due to choice, but there is also a biological component. Some scientists blame unhealthy modern diets and lifestyles, or environmental toxins. Others think the culprit may be a deeper genetic mechanism that would prevent overpopulation in a world with much longer lifespans... though few will go on the record with that controversial position. Regardless, male fertility appears to be dropping dramatically. Researchers at Hebrew University and the Icahn School of Medicine at Mount Sinai in New York examined 250 studies on male sperm counts in the developed world and found an annual 1.4% decrease since 1973. That’s a total decline of about 60% in 40 years. I don’t believe this will continue in a linear fashion, but if it did, it would mean that natural human reproduction would end in about a generation. Lower male fertility probably contributed to later births even among women seeking pregnancy. Since 2007, the age of first-time mothers has risen by about two years in the US. A few weeks ago, the CDC announced significant drops in US birthrates among all race and ethnic groups over the last decade. 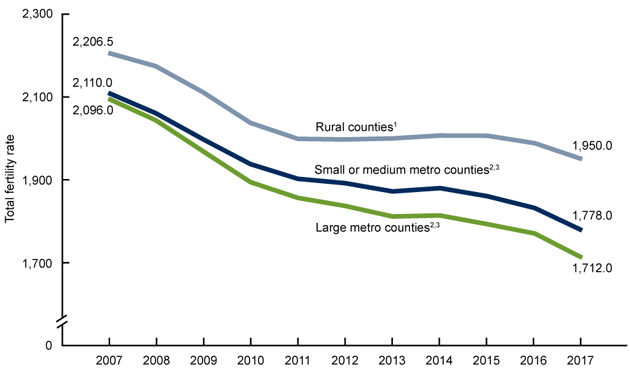 One interesting result: the drop is significantly faster in metropolitan than rural counties. We don’t know if this difference is a matter of choice or environment—but it’s interesting that rural and urban populations also tend to have different political alignments. If this rural/urban fertility disparity continues, it will have a major impact on the electoral scene. Compared to Europe and Asia, the US birthrate is still relatively high, at about 1.8 children per woman. At least 2.1 births are required for population replacement, and Europe and China are at about 1.6 births per woman. Within a generation, most of the world will be below replacement fertility rate. While some consider depopulation a good thing, economists like me worry that it endangers the economic growth needed to pull the rest of the world out of poverty. Of particular concern is that a shrinking younger population would be economically unable to care for a growing older population. Another thought: wealthy societies also have better ecological records. Depopulation could actually increase harm to the environment. I find it remarkable that depopulation and all its problems are looming just as scientists are proving the efficacy of anti-aging therapies. The cocktail approach that I mentioned earlier is only the tip of the iceberg. I’ve written before about induced tissue regeneration (iTR), the reactivation of the gene pathways that grow perfect embryos. At least a half a dozen important research groups are now working on biotechnologies that could reverse aging and significantly increase healthspans, probably into hundreds of healthy years. I’m convinced the end of poverty and plummeting fertility rates require such a medical breakthrough to maintain healthy population levels and functional economies. I believe the fact that they’re all converging at once is more than a coincidence, but I don’t pretend to understand the mechanism.